The collarbone (clavicle) is located between the ribcage (sternum) and the shoulder blade (scapula), and it connects the arm to the body. The clavicle is the first bone in the human body to begin intramembranous ossification directly from mesenchyme during the fifth week of fetal life. Similar to all long bones, the clavicle has both a medial and lateral epiphysis. The growth plates of the medial and lateral clavicular epiphyses do not fuse until the age of 25 years.Peculiar among long bones is the clavicle’s S-shaped double curve, which is convex medially and concave laterally. This contouring allows the clavicle to serve as a strut for the upper extremity, while also protecting and allowing the passage of the axillary vessels and brachial plexus medially. A clavicle fracture is also known as a broken collarbone. Clavicle fractures are very common injuries in adults (2–5%) and children (10–15%) and represent the 44–66% of all shoulder fractures. Despite the high frequency the choice of proper treatment is still debated. Both conservative and surgical management are possible, and surgeons must choose the most appropriate management modality according to the biologic age, functional demands, and type of lesion. 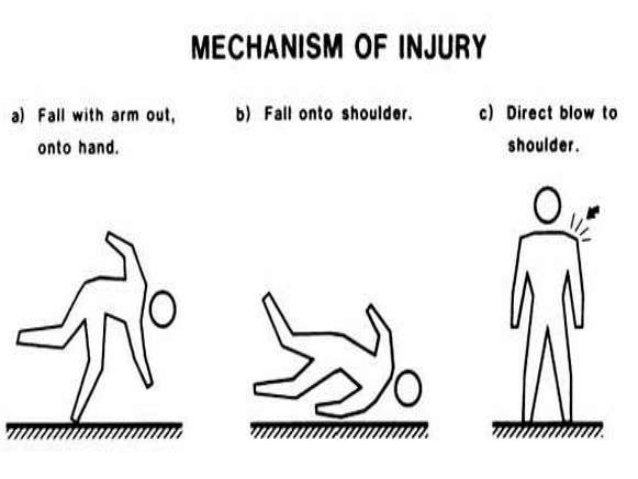 Younger individuals often sustain these injuries by way of moderate to high-energy mechanisms such as motor vehicle accidents or sports injuries, whereas elderly individuals are more likely to sustain injuries because of the sequela of a low-energy fall. Although a fall onto an outstretched hand was traditionally considered the common mechanism, it has been found that the clavicle most often fails in direct compression from force applied directly to the shoulder. Fractures of the lateral third of the clavicle were further sub classified by Neer, recognizing the importance of the coraco-clavicular (CC) ligaments for the stability of the medial fracture segment. Type I lateral clavicle fracture occurs distal to the CC ligaments, resulting in a minimally displaced fracture that is typically stable. Type II injuries are characterized by a medial fragment that is discontinuous with the CC ligaments. In these cases, the medial fragment often exhibits vertical instability after loss of the ligamentous stability provided by the CC ligaments. Type III injuries are characterized by an intra-articular fracture of the acromio-clavicular joint with intact CC ligaments. Although these fractures are typically stable injuries, they may ultimately result in traumatic arthrosis of the acromio-clavicular joint. A more detailed classification system (Edinburgh classification) was proposed by Robinson. Similar to earlier descriptions, the primary classification is anatomically divided into medial (type I), middle (type II), and lateral (type III) thirds. Each of these types is then subdivided based on the magnitude of fracture fragment displacement. Fracture displacement of less than 100% characterizes subgroup A, whereas fractures displaced by more than 100% account for subgroup B. Type I (medial) and type III (lateral) fractures are further subdivided based on articular involvement. Subgroup 1 represents no articular involvement, and subgroup 2 is characterized by intra-articular extension. Similarly, type II (middle) fractures are sub-categorized by the degree of fracture comminution. Simple or wedge-type fracture patterns make up subgroup 1, and comminuted or segmental fracture patterns represent subgroup 2. Venous stasis, discoloration, and swelling indicate a subclavian venous injury. 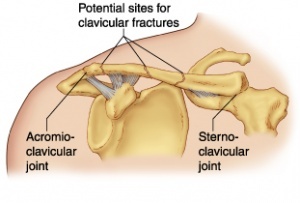 The most common symptoms of a clavicular fracture are: pain in de area of the fracture and crackling of the clavicula. The clavicula has an abnormal contour and the patient is unable to lift his arm due to pain. The patient hold his affected arm adducted and supports with his opposite hand. This position is more comfortable than another because it limits the pull from the weight of the arm on the fractured bone. Conservative or non-surgical treatment is the norm for middle-third clavicle fractures, and is recommended for not displaced fractures given the generally low incidence of non-union after conservative treatment of these fractures. There are numerous conservative treatment options available, the most common being the use of a sling or figure-of-eight bandage (also known as figure-of-eight splint, or back-pack bandage), or a combination of these two methods. There appears to be no consensus on the optimal duration of immobilization; some have recommended two to six weeks. Often no subsequent therapy is suggested to the patient. Sometimes, however, a patient will require stretching exercises to regain motion. We prefer to follow the patient with a structured rehabilitation in order to have a satisfactory outcome for most patients. To protect the healing clavicle, it is important to avoid contact sports for a minimum of 4 to 5 months. The indication for surgical treatment of lateral-third clavicle fractures is based on the stability of the fracture segments, displacement, and patient age. The integrity of the CC ligaments plays a key role in providing stability to the medial fracture fragment. Displacement of the medial clavicle is seen when the CC ligaments are disrupted (Edinburgh type 3B). The treatment of the clavicle fractures is still controversial and debated. The use of plate and screws fixation represents the gold standard in displaced and comminuted fractures. Non-operative treatment is mandatory in not displaced cases.